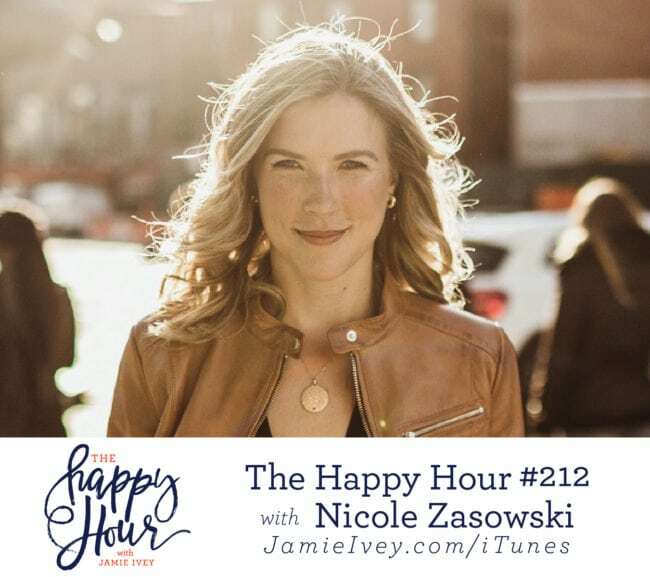 My guest for The Happy Hour #212 is Nicole Zasowski. Nicole is a licensed marriage and family therapist in Connecticut where she lives with her husband, Jimmy and her son, James. As an old soul who wears her heart proudly on her sleeve, Nicole also enjoys writing about her story and the way she sees God moving and molding her through it. Her first book is due to come out in January 2020! Alright friends, get your hearts ready because on today’s show Nicole and I talk about feelings. Whether you’re cringing or leaping with joy at this news, I promise this show is for you and you will be encouraged by her words. As Nicole shares at the start of the show, we can’t believe the lie that no one can understand our pain because we all at some point experience pain … and, we all have strategies we use to try protect ourselves from pain. Nicole shares her own story of how she realized her self-protection strategies were no longer working. It started with a cross-country move 7 years ago, and since then she has also had to walk through 5 miscarriages in just 4 years. She admits that it was hard to face that her strategies weren’t the answer, but when she was truly honest with herself and others, she started to “find a way through, not a way out” of the pain. Nicole also offers specific advice on how to walk along side a friend going through hard times. In the second half of the show, Nicole explains more about the Restoration Therapy model she uses that focuses on how we each have encountered love and trust. She also fills us in on what those protection strategies we use can look like. You guys, I think we can all identify ways we stuff our feelings or protect ourselves from pain. But, as Nicole said, our short term solution is just creating long-term pain. God does not love us any less when we grieve or hurt. He loves us through ALL of it, and He already knows our hearts. I loved talking with Nicole today, and I hope that you feel encouraged in the freedom you can experience when we are honest with God, ourselves, and each other! Build A Bear Workshop – Join the Bonus Club for free! Zip Recruiter – Try it for Free!